and that in all cases the route was planned TO AVOID ALL EXISTING BUILT-UP AREAS. 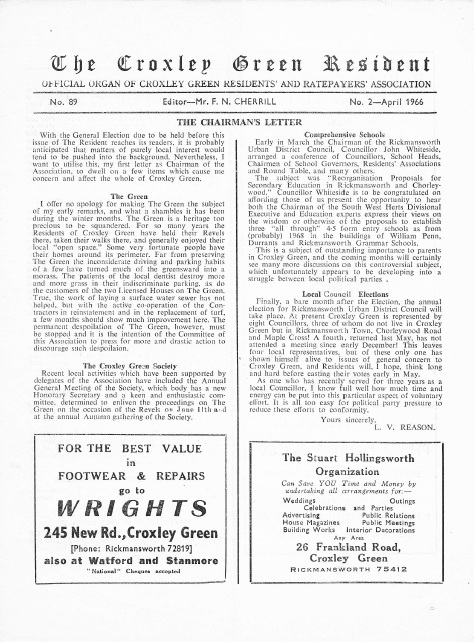 The next important event was in 1945, the outcome of a very comprehensive Planning Survey on all aspects of Greater London including Highways and from these deliberations it finally emerged that all County Councils concerned (some nine in number) were agreed that the earliest possible priority should be given to the North and South Orbital Roads a view with which the then Minister of Transport not only agreed but stated the proposed roads would receive the first priority. This event, in our opinion, was again a 'great success. All who witnessed the various events enjoyed themselves. It was pleasing to note the tradition of crowning the May Queen and children dancing round the Maypole, is being carried on. Three of the pioneers from the past, Miss Dolly Barton-Smith, Miss Ricketts and Mrs. E. W. Wilbee. devoted many years of their lives to this tradition; but are not all traditions based on the past? Thanks are due to those who gave their services voluntarily to make the afternoon so happy and successful. A Super Market? - We understand planning permission has been granted for this. Betting Shop - Application has been made to use premises at 204 New Road for this purpose. Footpath - Met. Station towards Goods Yard. Renovation work has recently been completed, and this we note with approval. thinning out and clearing of the dead wood and diseased trees will begin. press this item-although such pressure should not really be necessary (L.T.E. please note!). will provide an amenity for many years to come in honour of a great man, and for a long time beyond the span of life of our readers. As to the cost, this should not prove too great (one donation has already been received) and when it has been accurately determined we may appeal for contributions from any who share in this project. B. W. GARDNER, Chairman. A few issues ago I made a brief reference to this and the best informed opinion now thinks that this question will be with us in about 18 months to two years time. 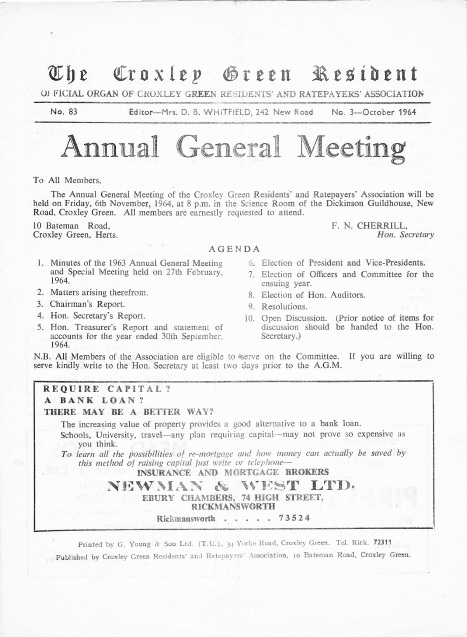 compensatory transfer of an area near Tring to redress the balance of the counties). It is, of course, possible for the part of Chorleywood in Herts to be transferred to Bucks and come under Amersham Rural Council in which case Chorleywood would cease to exist as a Local Authority. 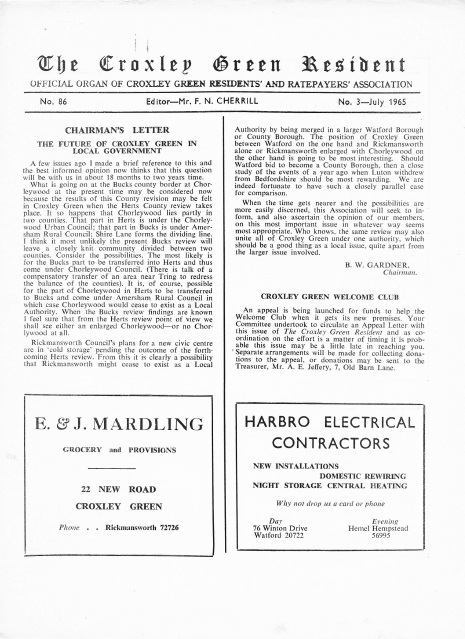 When the Bucks review findings are known I feel sure that from the Herts review point of view we shall see either an enlarged Chorleywood or no ChorIywood at all. Messrs. Arthur Pitkin Ltd., whose store is on this 3+ acres of land, of which part will be needed for the Cassio Bridge development, have offered the remainder of the land to the Council with vacant possession. Negotiations will proceed. 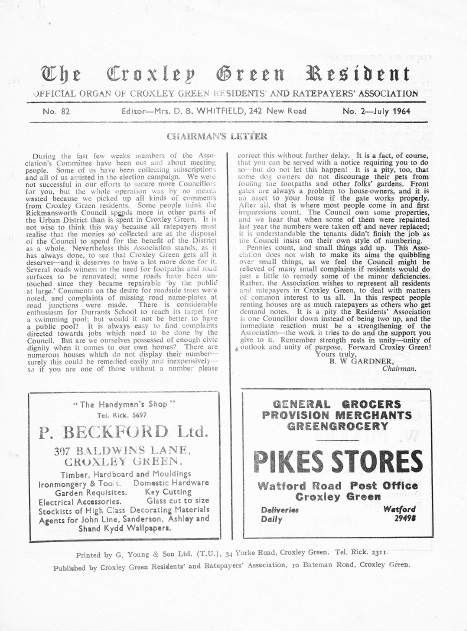 Readers may like to be reminded that several years ago "The Croxley Green Resident" published a coloured sketch showing how a block of shops would look on this site partly fronting Watford Road and shaped on the curve into Baldwins Lane. Alas this project never materialised, but now that the Council are contemplating spending our money on acquiring this land they might like to have a firm suggestion as to something really useful that they could organise on this corner. Incidentally, this area is a very poor entrance to Croxley Green at the present time as also is the Council owned land adjoining Croxley Green L.M.R. Station on the opposite side of the main road. In recent years there have been two cases in Croxley Green where a building contractor has so interfered with the footpath as to make its use dangerous for pedestrians. The Association took the matter up and it is now recorded that a resolution urging legislation has been approved by the London Accident Prevention Council. 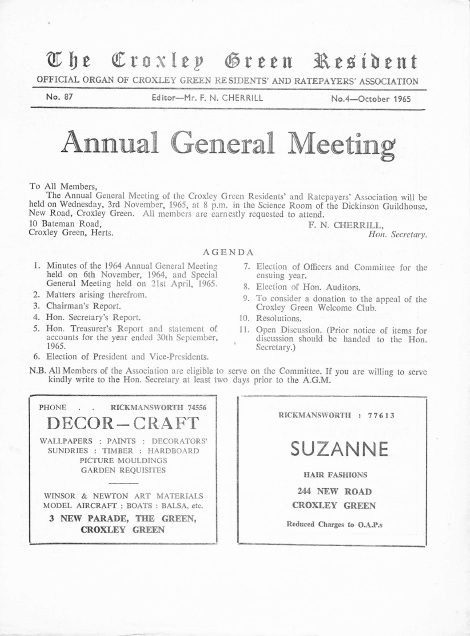 Sunday afternoon, October 3rd, brought excitement to Croxley Green when a disastrous fire ruined the, assembly hall of Dickinson Guildhouse. Tribute is hereby paid to the efficient attention of the Fire Brigade but alas their efforts were of no avail. This is a bitter blow to many organisations who have regularly relied on the use of the hall for plays and shows. 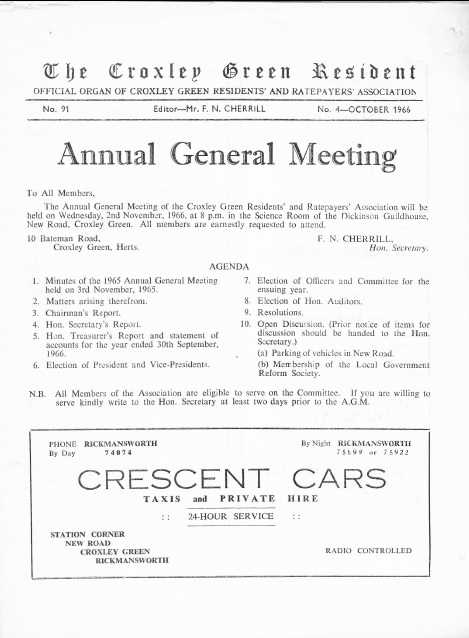 This rather pin-points the need for a public hall in Croxley Green. 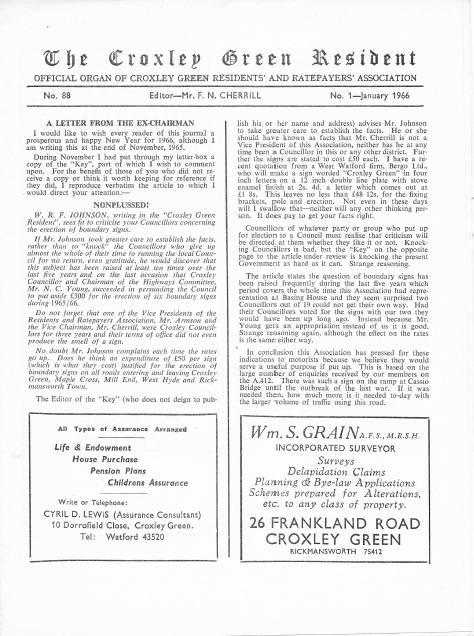 local government; the desire for the diversion of' traffic from Watford Road (probably to the expected north orbital road); trains to London; and the education costs in the rates. We hope to be able to publish the results in due course, but it shows we're not all asleep! Two years ago the bus shelter was damaged during the severe weather at the time. We now hear the Council has voted £75 for its immediate repair. THE GREEN - I offer no apology for making The Green the subject of my early remarks, and what a shambles it has been during the winter months. 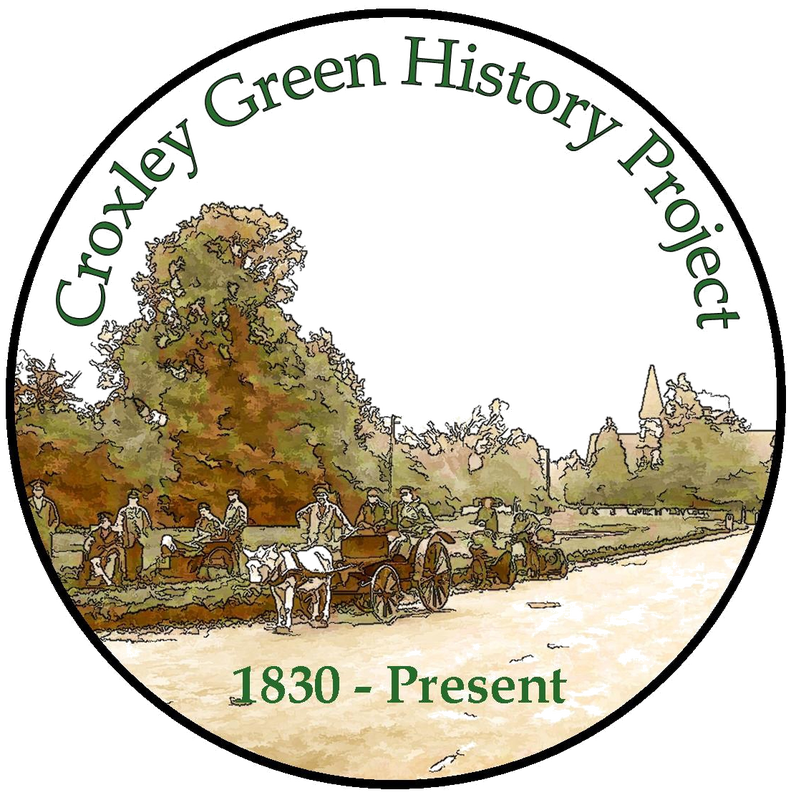 The Green is a heritage too precious to be squandered .. For so many years the Residents of Croxley Green have held their Revels there, taken their walks there, and generally enjoyed their local "open space." Some very fortunate people have their homes around its perimeter. Far from preserving The Green the inconsiderate driving and parking habits of a few have turned much of the greensward into a morass. The patients of the local dentist destroy more and more grass in their indiscriminate parking, as do the customers of the two Licensed Houses on The Green. True, the work of laying a surface water sewer has not helped, but with the active co-operation of the Contractors in reinstatement and in the replacement of turf, a few months should show much improvement here. 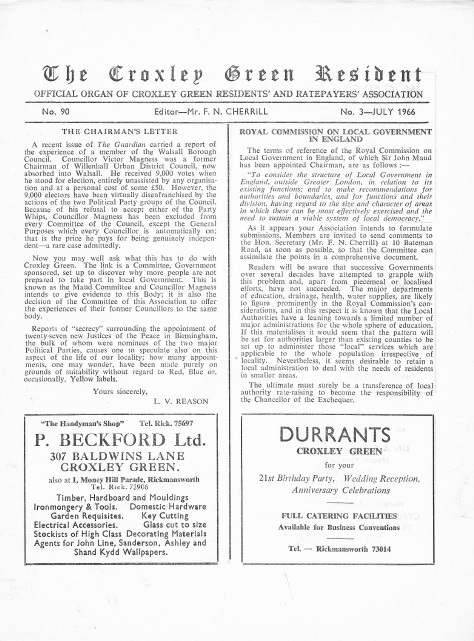 The permanent despoilation of The Green, however, must be stopped and it is the intention of the Committee of this Association to press for more and drastic action to discourage such despoilaion. 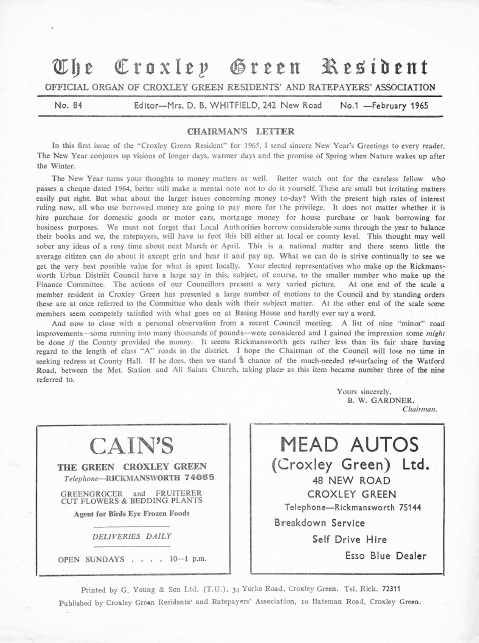 SEATS ON THE GREEN - It is understood that approval has been given for Dr. Margaret Miller to provide a seat on The Green near to Croxley House, in memory of Mr. and Mrs. Garner, formerly of Springfield Close, who did so much to raise funds in Croxley Green. which is a Common or a Green, or those possessing Common Rights. Your Association is considering the matter, but it is open for anyone t.o submit an individual statement. an order for the new equipment was placed. Summer will be over before the children have the facilities accorded to them. We have mentioned before, in criticism of the Council, that there is slender reason for decrying the jolly old slide as being dangerous, and in any case Messrs. Wick steeds of Kettering (the usual suppliers) do provide for a protective cage at the top of the slide. 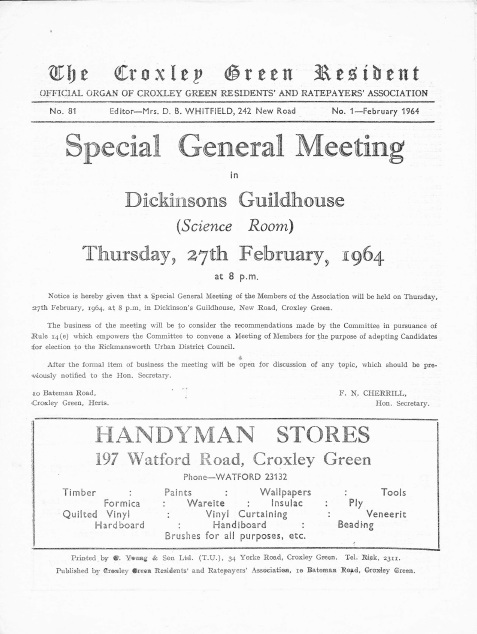 Are our Councillors old-fashioned? or can they not remember back to the times when they were young? be a section of the road near to Barton Way which would prohibit waiting for 24 hours each day. The Council did not reach a decision. 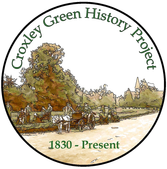 It is pertinent to note that neither Rickmansworth Council, nor any Councillor, has approached the Residents' Association to seek the opinion of the residents. 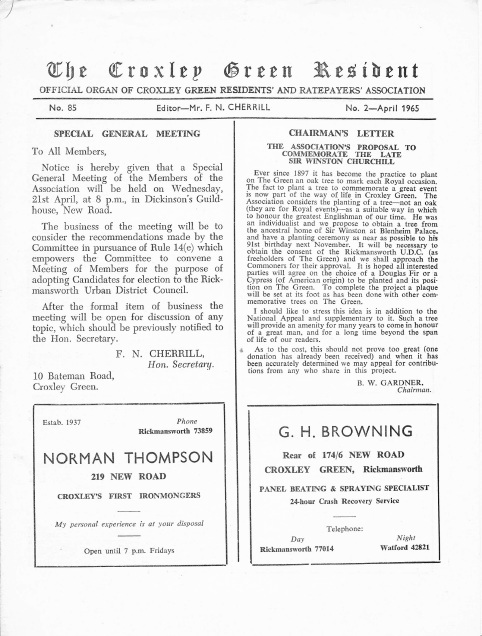 Arising from letters from several Traders, and because this matter affects people who live in New Road as well as shoppers, your Committee decided to remit the problem to the Annual General Meeting of the C.G.R. & R.A. on November 2nd, to give everyone an opportunity to air their views. This problem reveals yet another example of the lack of any kind of public relations policy on the part of our Local Authority.